See the Great Pyramid of Cholula and Puebla’s UNESCO-listed historic center on one easy, all-inclusive tour from Acapulco. The largest pyramid on earth by volume, Cholula surpasses even the Egyptian Pyramids. Visit the Africam Safari park and become immersed in the animal habitats, which very closely resemble the wild. The animals roam freely and the visitors can observe them from your own vehicles or the park's guided buses. Africam Safari has several habitats, including African Savannah, American steppes, Tropical Jungle, Mexican Forest, Tiger Lake, Lion Territory and walk-through adventure zone. There are approximately 2500 animals of 350 species that roam freely in a habitat which is said to encourage animal development and reproduction. Visit historic churches, buildings adorned in hand-painted tiles, and a religious art museum, and get an introduction to the craft of Talavera tile-making. Hotel pickup and drop-off, plus included lunch, make for a hassle-free trip.After pickup from your Acapulco hotel by an English-speaking guide, you’ll head to the Cholula archaeological zone. There, you’ll have plenty of time to explore the massive Great Pyramid. Learn about the history of the pre-Hispanic structures and see the Church of Our Lady of the Remedies, which was constructed atop the pyramid after the conquest of Hernán Cortes. 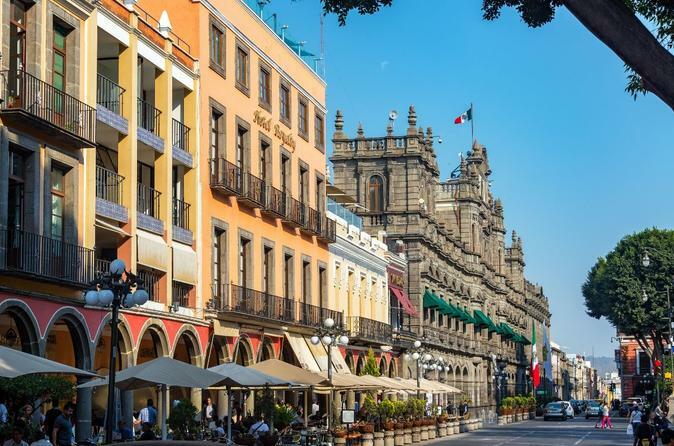 In Puebla, you’ll get an introduction to this historic city’s UNESCO-recognized colonial center with a visit to the ornate 16th-century Church of Santo Domingo. The church’s Chapel of Rosary baroque interior is considered a wonder of the art world. Next, head to a former convent that’s now home the Museum of Religion Art, followed by a tour of workshops that make onyx and Talavera ceramics. At the end of the day, enjoy drop-off back at your two stars hotel.